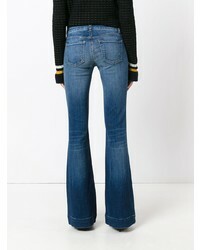 If you're hunting for a casual yet absolutely chic outfit, dress in a grey military jacket and blue flare jeans. Both garments are totally comfy and will look fabulous together. Bring a touch of sophistication to your getup with navy suede pumps. If you're after a casual yet absolutely chic outfit, try pairing a navy and white gingham dress shirt with J Brand love story back heel destruction jeans. Both items are totally comfy and will look fabulous together. 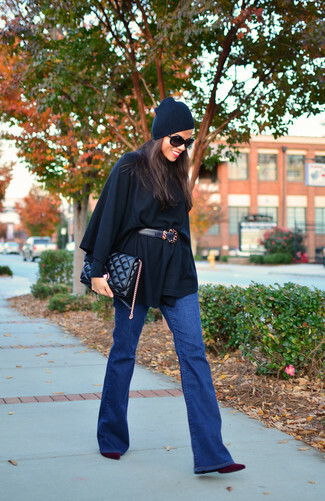 This pairing of a black poncho and blue flare jeans is clean, stylish and oh-so-easy to replicate! And if you want to instantly up the style ante of your look with one piece, enter dark purple suede ankle boots into the equation. If you're facing a sartorial situation where comfort is prized, go for a beige short sleeve button down shirt and blue flare jeans. To bring out the fun side of you, complement your look with beige canvas wedge sandals. If you're in search of a casual yet totally chic ensemble, go for a grey tank and J Brand love story back heel destruction jeans. Both items are totally comfy and will look fabulous together. If you're scouting for a casual yet absolutely chic outfit, go for a black coat and J Brand love story back heel destruction jeans. Both items are totally comfy and will look fabulous paired together. 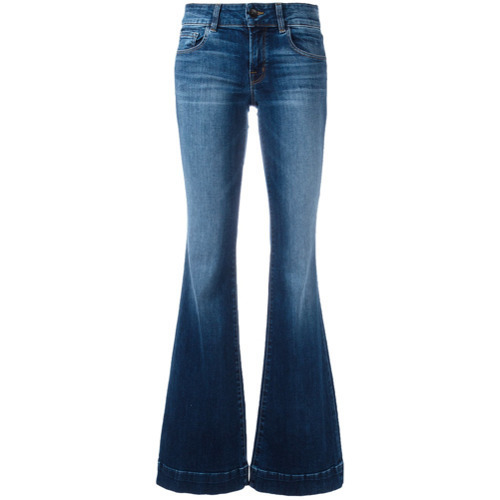 When it comes to footwear, this ensemble is complemented nicely with purple suede ankle boots. 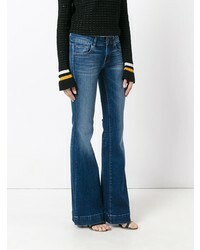 This pairing of a tan crew-neck t-shirt and blue flare jeans is so easy to create and so comfortable to wear as well! Perk up your getup with beige leather pumps. For a neat-meets-totally stylish outfit, consider wearing a beige dress shirt and blue flare jeans — these two pieces go pretty good together. Finish off your look with dark brown leather heeled sandals. If you're hunting for a casual yet totally chic getup, wear a white lace peasant blouse and J Brand love story back heel destruction jeans. Both pieces are totally comfy and will look fabulous together.